Veteran Nollywood actress Florence Onuma and her husband Imo-based business man Chijioke Onuma were recently interviewed by Samuel Abulude of Leadership Magazine. The couple talked about their marriage and advise young couples on what makes marriage work. How has your marriage been? 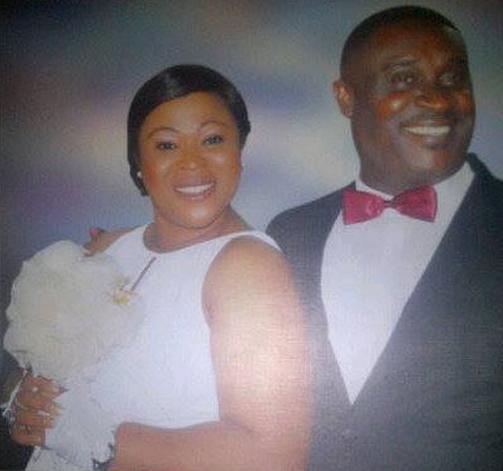 Mr Onuma: We have been married for 23 years with two children and I have no regrets. It’s been beautiful. I have been enjoying my marriage. How have you coped getting married to a celebrity? The fact is, I understand the nature of her job. In every marriage, you must understand yourselves. If you understand the nature of your spouse, you would be able to adjust and cope with the challenges. It’s understanding that matters. What of when the wife is more popular and richer, won’t the man become insecure? That is inferiority complex. The position of a man and a woman in marriage is not in contention as you are not in a place to know who is superior and who is inferior. It is not a contest if she knows that you are a man and occupies the position of a man except if you have inferiority complex. The issue that your wife is more popular than you or has more money than you is not an issue. It is even to your advantage that your wife is more popular and richer. It takes nothing from you. Your name is in the limelight. She bears your name not her name alone. It’s your name she’s advertising. How were you able to protect your wife and kids from the influence of your family? First, it is your family’s interest that is utmost on your mind. You must find your interest and what the interest of your family is and make it work. Other people’s interest is secondary. A lot of people go into the marriage for different interests. It’s a long time ago. Then I was a young man, a clerk working for the West African Examination Council (WAEC). It was on a Good Friday during one of the Easter holidays. I was on my way to Owerri and she too was on her way to Owerri. I was at the airport; we didn’t meet at the airport though. I was trying to catch a flight and her brother also brought her to the airport to catch a flight but the flight was cancelled. So, I went to Iddo (Lagos) to board a bus to Owerri and she was also brought to take a bus to Owerri. Fortunately, I happened to be together in school with one of her brothers in secondary school. I was first in the bus and then she entered after which the brother spotted me. He handed her over to me, we got talking. His brother said that was his ‘baby sister’ and that I should take good care of her and I took good care of her really (general laughter). That was how we met and the rest is history. That incident happened in 1984. What was the major ingredient that has kept the marriage together? The love of God. The two of you must love God together. If the love of one for God is waning, the other must bring it at par. It is God that makes the marriage work because he created it. Nobody will tell you that marriage is a bed of roses. It isn’t. Its full of challenges. How can one cope and manage the affairs of being ‘the man’ particularly when your wife exhibits new traits you weren’t aware of? The summary of it is friendship. The two persons are coming from different backgrounds. So, you must understand where she is coming from to understand why she did that. You need to tolerate one another and communicate effectively. Your wife is a celebrity. Can you describe her personality since you know her better? It’s you people that know her as a celebrity; I don’t see her as one. I know her as my wife, my first love and the mother of our children. That is how I know her. I am conservative but she is not. If she was like me, the house won’t be lively like it should. It takes the positive and negative to make a spark. After 23 years of marriage, what is your advice for young couples? My generation is more realistic than the new generation. I have discovered that the present generation is more cosmetic. They don’t like to tell themselves the truth. I always advise people particularly young women and men planning to marry to look beyond the surface. Look beyond the outer person and look for the inner person. Every human being has a covering. Infact, some have four faces but it is only one that is the real thing. So, look for that real thing. That is why I said a lot of people marry for the wrong reasons. Some marry because the other fellow is tall or short. Some marry because you are rich without finding out the real person. Look out for the real person and see whether you are compatible with the person before you enter into marriage. The moment you are not compatible with your spouse or partner, there is nothing to do about it. Them also, the family where the person is coming from is very important. If the person is brought up in a family where things are not right, it will affect the person in marriage. The experience the man or woman has in her family will definitely form the basis of how he or she sees life and marriage. For example, if a person was brought up by a single mother and has seen more of the women playing the roles in her life without a father figure, it will be difficult for her to trust anyone. The lady will want to act the way her mother handled affairs. If your children decide to marry someone who’s a product of the single mother, would you allow it? It depends on them. What I cannot allow, they may be able to allow. But from experience, there are more disadvantages than advantages in marrying from a single home. Someone may be able to handle it and the other may not. It differs like the former head of state, General Ibrahim Babangida, when he was asked why he allowed his son to marry more than one wife unlike him, he replied that his son could handle more than one woman. That must have been the reason for his marrying them but he couldn’t handle it. That explains it. You must understand yourself, what you want in marriage and what you can allow but in all, God must be the foundation of all marriages that must be successful. 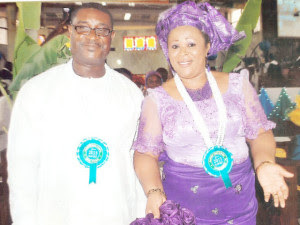 23 years of marriage what has been the staying power? The staying power is God. I saw my mother handle the home affairs perfectly and she inspired me a lot. She had seven children and I was the last: five men and two women. My mum was very enterprising and hardworking. As she was leaving her life and handling issues, I was learning from her. I saw that my mother anchored everything on God. That really inspired me. How have you been able to combine your duties as a wife and mother vis-à-vis your job as an actress? It takes wisdom and God. In the hierarchy of things, God is first; your family is next and work is last. Yes, you need to work and make your family comfortable and support your husband but in as much as you need money to keep the family, we need more than money to keep the family. You need love and affection; you need care to keep the family. I know some families that are billionaires but the children are running amok. The children are on drugs, the family is in disarray. So, it takes more than money to keep the family. The Bible says, when you have two alternatives, you have to take the major thing and neglect the other. How has the challenges been in 23 years of marriage? With understanding and love, we keep moving. In this country right now, the billionaires are crying; the poor are crying. I don’t have challenges that overwhelm me. The major challenge; emotional challenge; I don’t have. How about the pressure of the other family members of today? It is lack of contentment and understanding that is causing the problems in marriages where they chase shadows. I noticed nowadays that it is a rat-race as people are pursuing things instead of building the home. The mother is running after money; the same with the husband neglecting the family. If someone owns a jeep and I don’t have the money to drive one, how will I get it? Some either go and prostitute or steal. If I prostitute, I could get sexually transmitted diseases. So, must I own a jeep? The love of money they say is the root of all evil. If I need money, I pray to God and get clarifications from him whether I really need it or not. If I get clarifications to go ahead, it’s then I pray for direction on how to get it and also work towards it. MARRIAGE CAN END IN A SECOND TO WHEN YOU CELEBRATE YOUR THIRTY YEARS OR AS SOON AS YOUR WIFE REACH MENOPOSAL , AND SHE IS NO MORE SELLING THE RED OIL MONTHLY. THEN , YOU MIGHT END UP GOING SECRETLY TO SEEK HELP FROM ALL THOSE SINGLE MOTHERS YOU ARE TALKING ABOUT . RSO WHAT WOULD YOU DO IF ONE OF YOUR DAUGHTER FIND HESELF IN THIS CATEGORIES OF A SINGLE MOTHER , ARE YOU GOING TO JUMP INTO THE WELL ? I AM NOT AGAINST ALL WHAT THIS MAN HAS SAID , BUT I AM AGAINST WHAT HE SAID ABOUT SINGLE MOTHER . THERE ARE A LOT OF WOMEN WHO BECOME SINGLE MOTHER BECAUSE THEIR HUSBAND DIED , WHEN THE CHILDREN ARE STILL TOO SMALL. BUT IN ORDER TO HELP THE CHILDREN EDUCATION AND SAVETY,THE MOTHER MAY DECIDE TO REMAIN SINGLE . TO BRING UP THE CHILDREN ALONE , SO WHAT WOULD SAY TO THIS? BECAUSE I HAVE SEVEN CHILDREN AND I BROUGHT THEM UP ALONE .,UP TO THEIR MASTERS DEGREE., AND THEY ARE ALL MARRIED . SO WHAT DO YOU WANT TO SAY TO THAT. SO IT MEANS YOU ARE WRONG , BECAUSE BEING SINGLE HAS A CATEGORIES. SOME PEOPLE CHOOSE TO BE SINGLE , BECAUSE MARRIAGE IS NOT THEIR CUP OF TEA, SOME PEOPLE REMAIN SINGLE BECAUSE THEIR HUSBAND DIED. SOME PEOPLE REMAIN SINGLE BECAUSE OF THE WAY THEY HAVE BEEN BROGHT UP . IT WAS VERY WRONG OF PEOPLE TO HAVE THIS MENTALITY THAT ANYONE WHO ARE SINGLE ARE WHORE.